Professor of accounting Prem Sikka untangles the maze of company structures that have allowed the business to avoid tax for years. Over the weekend a newspaper reported that Caffe Nero has not paid any corporation tax in the UK for the last decade despite total sales of around £2bn through its 637 shops. The company has consistently reported a loss. Accounting and tax losses in company accounts rarely connect with any commonsensical understanding of economic loss. The losses, as I previously indicated, can be manufactured by the funding model chosen the company’s controllers and financial engineering at Caffe Nero has also enabled it to wipe out its tax bill. Caffe Nero is part of a maze of companies. The trail leads to a company called Saratoga Limited based in the Isle of Man and Rome Holdco Sarl registered in Luxembourg, which in turn is controlled by private equity entrepreneur Gerald Ford. The complex structure gets in the way of a comprehensive analysis, especially as the accounts for the Isle of Man and Luxembourg operations are not easy to secure. 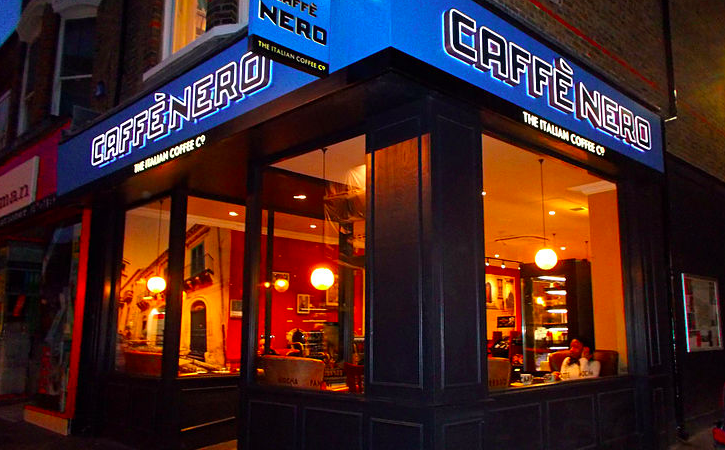 Some practices and reasons for the reported loss are evident from the publicly available audited accounts of Caffe Nero Group Holdings Limited. The Group’s most recent accounts for the year to 31 May 2017 reported sales of £313m (2016, £275m), gross profit of £71.5m (2016, £75m) and operating profit of £17.7m (2016, £17.5m). Some of Caffe Nero’s competitors are known to have reduced UK taxable profits through intragroup purchases/sales and royalty payments. Whether Caffe Nero’s profits are affected by any intragroup royalties, management fees or purchase of raw materials (e.g. coffee beans) is not known. However, the healthy operating profits morphed into loss before tax of £25.5m (2016, £24.2m). How did that happen? The key ingredient is the finance cost or interest charge of £44m for 2017 (2016, £42m). In December 2006, Caffe Nero agreed to a £225m management buyout led by Gerald Ford. The chosen financial model was to invest as little as possible through shares and load the company with debt, a typical private equity model as loan interest qualifies for tax relief (a public subsidy) and maximises shareholder returns. In January 2007, a loan of £98.4m was provided by the parent company to Caffe Nero Group Holdings Limited. The parent company borrowed the money from another group entity. This loan is repayable on demand and carried interest rate of 25% per annum for the first year, 23% per annum for the second year, 20% per annum for the third year and 19% per annum thereafter. Compare this to the interest rate for loans from third parties. The company’s 2017 accounts state that the interest rate for a “senior” debt is LIBOR+3% margin”. The interest on the above loan is payable by one entity to another within the Caffe Nero empire and eventually finds its way to the Luxembourg parent company. No cash leaves the group, but enables Caffe Nero Group Holdings Limited to record an expense and reduce its UK taxable profits. For the years 2017 and 2016 the interest charge for the intragroup loan against Caffe Nero’s operating profits (see above) was £15.899m and £14.824m respectively and wiped out most of the UK taxable profit. However, the interest is not actually paid. It is rolled-over. From its inception to May 2017, the total interest on the £98.4m loan is £136.691m. The rolled-up interest is added to the original loan and has now become £235m. This amount of profits has effectively been shifted from the UK to Luxembourg via a loan deal and has reduced or wiped out the UK tax bill. The £235m loan is secured and that affects the distribution of assets/cash in the event of bankruptcy. The normal order of distribution places shareholders at the end of the queue. But by funding Caffe Nero through loans rather than shares, its owners have placed themselves at the head of the queue for its loan repayments. The company has other debts of £312m and interest payments on that also reduce its taxable profits. These debts are also secured and in the event of bankruptcy, banks would be at the head of the queue. A note to the accounts of the company states that “The Group’s loss before tax arose due to third party arm’s length interest payments to banks … the Group has not included any of its interest payable to ultimate shareholders companies, only third party banks, in its corporation tax computation”. This claim is problematical because the £25.5m loss (see above) is arrived at after the deduction of £15.899m interest (2016, £14.824m) payable to other group entities and these amounts are included in the total interest charge of £44m for 2017 (2016, £42m). In view of the confusion, a sight of the company’s tax computation would be helpful but it is not available. The 2017 balance sheet of Caffe Nero Group Holdings Limited shows total assets of £325.9m, which may nor may not be the market value of the assets. Debts far exceed the assets. If an unfortunate bankruptcy were to occur unsecured creditors are likely to be severely squeezed. According to the 2017 balance sheet some £35.6m is owed to trade suppliers and other creditors, including HMRC, are owed another £9.5m. Caffe Nero’s losses are due to its funding choice. The UK laws are complicit in enabling the company to shift profits and avoid taxes through intragroup interest payments. The most effective way to combat this is to abolish tax relief on all interest payments. Tax relief on interest payments for house purchase and other items for individuals was abolished because governments claimed that this was an unfair subsidy and distorted markets. The same logic should apply here as complex financial deals and structures are distorting competition between local/national and international businesses.